I don't know where this road is going to lead but I can say with certainty that NOTHING has unfolded this easily before my eyes. NOTHING. The events and circumstances that lead me to South Carolina can only be defined as a fated road; the path of least resistance pushing me in a clear direction where there is no denial of where it is I need to be. I cannot explain how or why I have moved with such swiftness. My visit in January followed by my visit in June and here I am in October making the move with a job already in place and a "hellafied" support system like no other! I am extremely grateful for all the moving parts that is making this transition so easy. From my friends and family here in Hawai'i that have put up with me for the last year to my cousins in South Carolina, "my soft spot to land," and all the friends and family from California to Utah to Texas and to Maryland that have dealt with my bouts of sadness and erratic behavior. They are the true MVP's in my world. I don't know the wreck I must have looked like just a year ago but I sure don't feel like that today. And with the job offer I accepted in South Carolina and the adventure that awaits me there, life is only getting better and better. I untangle myself from anything that causes me sadness or causes me to second guess my self worth. Surely if you couldn't recognize my value in the past when it was all yours to have, why should I believe that you see it now? Who would have ever thought that this island girl would fly away to such a foreign place. South Carolina. I think of it and a smile creeps across my face not just because of the memories that I have already made but because of the new experiences that await me. I feel like I am moving to live in a Nicholas Sparks novel (all of his love stories are set in the Carolinas). **cue romantic music** It excites me and fills me with wonder. I am going toward living my wildest dream. I am speaking my future into existence. It is already a reality (inside my mind) - I am a published author telling the stories about love and about culture, about relationships romantic and familial. I am writing the memoir that every broken-hearted woman needs to read to see themselves in me and to find their own strength to overcome any sad reality. Yes. I feel this pull to South Carolina and it represents freedom from my past. It represents me being my most authentic self. It represents new beginnings. I have craved this and longed for it, it seems, all of my life. Love has dictated all of my adult life. This past weekend, I came to a quick realization that I deserve everything my heart desires. 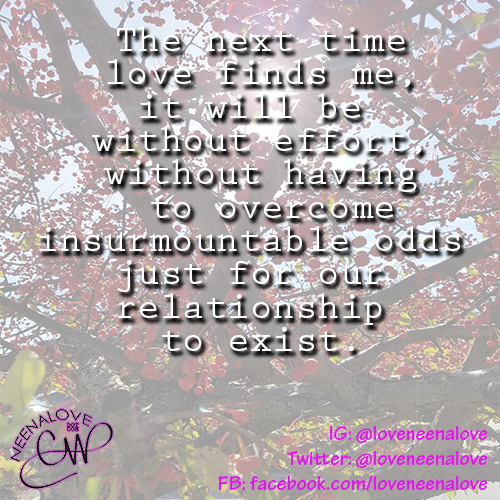 The next time love finds me, it will be without effort, without having to overcome insurmountable odds just for our relationship to exist. I will never have to wonder if he loves me because it will be apparent. His pursuit of me will match or exceed my efforts and I will be in competition with NO ONE. I have come to realize that I am worthy of a love that is big and sincere. It is not my job to prove to anyone that I am a good woman. Even though I categorize myself as the realest ride-or-die chic, I am not the poster child for all good women.Why should I continue to portray myself as this loyal partner when it goes unappreciated? My display of loyalty and honor and respect for my partner has me sacrificing my own needs. I compromise so much of who I am to be "that girl" for my man. I'm done with that. Some of my closest friends tell me that I should wait for my ex-husband, wait for him to want me again. I think it is so degrading for me to wait around for him. If I wait for him, I'm telling myself that he is more important than my own needs, that my heart is not as important as his love. It's been a year since we split. I still adore him but I am tired of being sad. I am tired of carrying around my broken heart and if there is love for me on the horizon, may it be pure and free from any pain and heartache. I don't want to associate new love with any pain or broken hearts. Some say that the pain adds to the the depth of the relationship but I don't need it. I want it to lift me and push me to the highest heights. I want to laugh uncontrollably in his arms and feel the aching in my belly that comes from laughter. I want to feel butterflies every time I think of him and see him. I want to feel him gently supporting my every endeavor no matter how stupid it may sound. I never want to worry about another broken heart. Thinking of trusting my heart to another man scares me. Is it unrealistic to have an expectation that a man could love me for life? True, faithful, and full of genuine love and affection not just for a couple of years but for life, forever? What I really want is to put all of my broken hearts behind me and never look back. I know I speak about forgiveness and having no malice in my heart but I don't think I can let go of the pain of my broken heart.... at least not yet. I don't know what tomorrow brings. All I know is the condition of my heart right now. It's a little bruised up and not ready for anything serious. I don't know when I will be ready again. I take it one day at a time. Some days I feel good. Some days it takes everything in me NOT to fall to pieces. Songs normally trigger a reaction. Billy Ocean's "Love is Forever" will have me a complete and utter mess. And, well, I'm tired of the emotion. I am tired of the bouts of sadness. Don't get me wrong though, I love to be in love. Heck, my moniker as of late has been hashtag-i-still-believe-in-love. I do! I really do... just not for me at this very moment. Time is just flying. I have just about two weeks left at my job. After this, I will be making my way to South Carolina. That will be home for at least the next year. I am extremely excited to start a new chapter in my life. Though I move forward with trepidation I am also very aware of how blessed I am that I have such a wide circle of close friends and family who help me to move ahead with nothing but my best foot forward. It's amazing how much has happened in the last year. I am grateful that I am not the girl I was just a year ago. When I was going through the break-up, I was very sad for several weeks. Sometimes the sadness creeps up now and I cry my eyes out until I feel some relief. I pick myself up and keep moving forward. One day I will be able to talk about this without all the pain. For right now, I will just have to cry through it. When the ex and I split last year, he moved out first. Eventually, I moved out so that we could prepare the home to be sold. I downsized considerably. We sold almost everything. He took one bed and I sold the other. He took the big TV and I sold the other one. We sold all the other furniture. I downsized my library of books considerably. I don't like to think of how many books I donated to Goodwill because each book was so precious to me. I had to detach from my relationship with the words on those pages and yet I still have tons of books that I kept. Throughout the past two weeks, I have been combing through my stuff again. This time, I am downsizing for my move to South Carolina. It is unbelievable the amount of paperwork that I was able to throw out. I have had to decide what to keep, what to shred, what to send back to my ex, etc. etc. I came across our marriage certificate. We got married in Illinois right outside of St. Louis. I remember that it was a very cold and wet November day. I also came across our divorce decree. My own hand wrote out every single detail on that decree. How did I have the strength to separate the material things of our lives in that application for divorce. It is not even what I wanted and yet my handwriting is all over it. Normally, if you go through an attorney they draw up the paperwork and draft a formal decree separating the details of a couple's life. We did it on our own, without a lawyer. It's cheaper (for him) and I am not an idiot where I can't figure out the paperwork. I tear up just remembering that day. My stomach was in knots all morning long as I sat there in our living room filling out paperwork before the courthouse opened. I distinctly remember the clerk at the court looking at us as so strange because we weren't crying or fighting at her window. That doesn't mean that I didn't want to cry, it just means that I maintained a calm decorum so as not to embarrass myself or him. Yesterday, as I was going through a bin of stuff, I came across a birthday card from my ex. It brought tears to my eyes and almost thwarted my efforts to pack my belongings. I am not surprised at the emotion that it stirred in me. I will always be a sentimental fool. It is probably one of my trademarks. I have held on to pieces of clothing, material, letters, pictures, broken jewelry all in the name of sentimental value. In fact, I just parted with a gold hoop earring that I received from my ex. He brought the pair as a gift for me while he was deployed to Iraq. I was so bummed when I lost one side of the pair on a trip to Europe. I don't remember what year he wrote the card to me but it had to have been during one of our happy years because of what he wrote. "To the best wife a man could have. I love you." I remember when he used to feel like that about me. Like I was the best thing that ever happened to him. Like I complimented his life. Like there could never be another that he would ever love. Like his world started and stopped with me. And I don't regret anything that has happened - not our meeting and falling madly, deeply in love or our private nuptials all by ourselves in Illinois (we eloped), or our wedding dinner at Olive Garden - just the two of us. I don't even regret our break up. Of course if I could choose, I would have selected to stay together and work on our relationship. I did not know I had driven him to the point where he just did not want to be with me any more. None of it matters and yet all of it matters. All of it contributes to the ever evolving me. It makes me who I am - this deeply feeling woman. The falling in love and the broken heart adds facets to my life that eventually will glow and shimmer in the light just like a diamond. The more facets, the more light I reflect. I love that my heart is so weathered and has so much mileage on it. Truly, one day I will sparkle even brighter than I do now. And though I do not wish this pain on anyone, I am so extremely proud of my ability to rise above the hurt. I am ready for this move to South Carolina. I am more sure about this than anything I have ever done before. I am so ready to do what makes me happy and so ready to live out my wildest dreams. It is so exciting to move in a direction that frees me, liberates me, and pushes me to be the best version of myself.